Canada Day — the First of July — is observed "not only throughout the nation, but also internationally." This year, Canada’s third-most populous province is giving the world extra cause to celebrate: on July 1, British Columbia becomes the first state or province in the Western Hemisphere with a comprehensive, revenue-neutral carbon tax. The BC carbon tax starts at a level of $10 (Canadian) per metric ton of carbon dioxide, equivalent to 2.41 (Canadian) cents per litre of gasoline. In U.S. terms and at current exchange rates, that’s $8.91 per short ton, or just under 9 cents per gallon of gas. The rate rises by $5 in each of the next four years, reaching $30 Canadian per tonne (U.S. $26.73 per ton) in 2012. A new Climate Action Credit will pay lower-income BC’ers $100 per adult and $30 per child per year. The bottom two personal income tax rates have been reduced by 2% on the first $70,000 in earnings. The corporate income tax rate has been reduced to 11% from the current 12%. The small business tax rate has been cut to 3.5% from 4.5%. Each provision will expand in tandem with the tax rate. And, showing impressive political pitch, the ministry last week preceded the tax with what it calls “an immediate Climate Action Dividend” — $100 for every man, woman and child in British Columbia — via dividend checks sent to province residents. Dion is staking his party’s campaign to replace the Conservative government on a carbon tax featuring a $15.4 billion, four-year Green Shift. Canadians are receiving, and participating in, a national tutorial on carbon pricing, “tax vs. cap” and revenue-neutrality. Still, the tax is a giant step — even a leap. At midnight tonight, North America will have its first large-scale, socially-mandated carbon price. Millions of carbon-impacting decisions will begin to be made with at least some recognition of the climate-curing effect of reduced carbon emissions. Starting now, BC residents who use less carbon than average will be rewarded with an income boost. With luck, the province’s ruling Liberal Party will be rewarded as well by voters for showing courage, vision and populist appeal. And perhaps in the not too distant future the U.S. will take a page from its northern neighbor’s play book and supplement its imports of ice-hockey players and Canadian Club with something even more sustaining. The tax is a tax and that make things more expensive. what will the tax be used for? Joe, you’re asking an important question. When is a tax not a drag on the economy? When it’s a tax on pollution and it’s revenue-neutral! 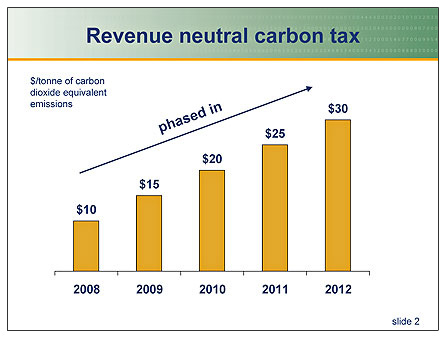 BC’s use of the carbon tax revenue is one of its most exciting and innovative aspects. Almost all goes back to households and businesses (not to government coffers) by reducing other taxes and by distributions to individuals. Every tax government impose to any company, finally affect the consumers at the end. Consumers have to pay the higher price for everyday stuff, so basically these kind of taxes are indirectly on the consumers and they do not affect any industry or individual company.